Get ready to zoom through a prehistoric jungle! ELCÕs Dino Safari Building Playset is a cool customizable racetrack toy perfect for energetic kids of all ages. The unique activity set lets you design and build your own wild pathways through a fantasy safari. Once youÕve created your track, race your included safari cars around the jungle pathways. This science fiction set from ELC includes 5 dinosaur figures, material to build your track and a battery operated car. 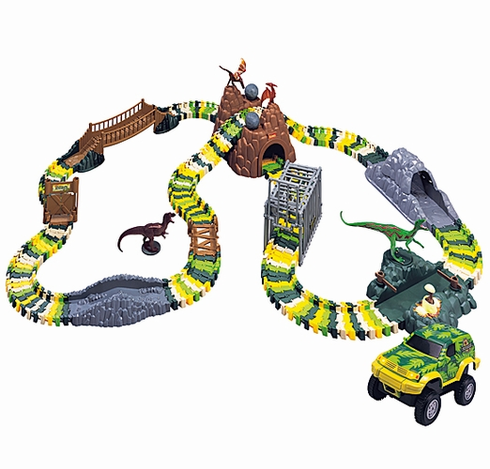 The Dino Safari Building Playset enhances creativity, construction skills, motor skills and problem solving skills. This dinosaur activity toy requires one AA battery. Age: 3 years and up. Dimensions: 14.5 x 23 x 5.25 inches.